Just Toys Classic Cars is very proud to present one of the most beautiful 1965 Ford Thunderbird convertibles to hit the market in a very long time. This car just has beautiful lines, everything works beautifully and it needs to be in your garage. The previous owner has owned this car for 32 years, and the restoration is 20 years old and had we never mentioned it, you would never have known it. The body lines on this car are absolutely flawless from front to back. This car was originally Rangoon red. Now, that paint job that we mentioned is now is now Lipstick Red and it is absolutely beautiful. This is the color that the car should have been from birth. All of the metal is straight and the bright work is so shinny that you could shave in it. One cool thing that you will also find on this car are the sequential tail lights. That's right, this was the first year for them. The Cougar tends to get the credit for them and then Carroll Shelby used them, but they were first found on the 65 Thunderbird. This car is beautiful from any angle that you look at it that is for. The interior of this car is just as flawless as the exterior. It was completely redone about the same time the car was painted and you are not going to find a flaw in it. The power seat works just like it should so slide yourself in to this extremely comfortable seat and slide that steering wheel in place and get ready to cruise. All of your gauges are easy to read and easy to reach. This is almost like a cockpit interior. There was a power antenna installed with a toggle switch right under the center of the dash. The air will blow you out of the car as soon as you turn it on. The AM/FM radio work great and there is even a disc man wired up in the center console so you can play all of your modern tunes as well. We could go on and on about this beautiful interior. The top as you will see in the you tube video operates flawlessly. The condition of the top is in beautiful shape as well. Now for the power plant under the hood of this beautiful bird. Under there sits the numbers matching 390. Early in it's life the first owner had overheated the motor. So, it was completely stripped down, and bored .030 and completely rebuilt. Since they had the motor out, they went ahead and rebuilt the transmission at the same time. This car just purrs like a kitten and hits all the gears solid like it is brand new. This is a complete numbers match car. What else can we say. This car has only had two owners in it's life. It has been very well maintained and needs to be in your collection today. We have a complete record in chronological order of what was done to the car. 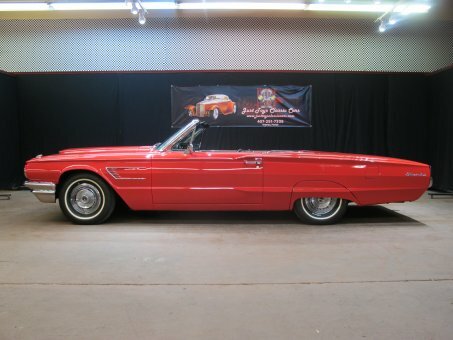 You will find other 65 Thunderbird Convertibles, but very few this nice. As you will see in the NADA numbers below you are saving $4,475 when buying this car. So there is plenty of meat on the bone if you ever re sell it. We offer classic car financing for those that would like to take advantage of the option. We look forward to speaking with you soon, and making you the newest member of the Just Toys Classic Cars Family.